Emma, my eldest daughter has been diagnosed with Motor Neuron Disease (FAQ). People are always interested in finding a little more our about here so I thought I would capture the salient points on this page. It is the rarer; Familial MND that Emma has been diagnosed with (FMND). Her natural father; I’m actually her step father but that is a term that we never use, also had MND and he lost most of his siblings to the same condition. Emma started to show symptoms in late 2004 early 2005. These included tripping, falling over, a general weakness in her legs. They put this down to growing pains, and then because she was wearing Timberland boots but not lacing them up properly. This is one of my favourite photos, it was one of the last major “physical” days out we had, we all managed to get to the top and down again safely. Emma managed to get up OK but tripped and fell a lot on the way down, her strength was going and downhill is generally more difficult to keep your balance anyway. To treat this she went to the hospital on a monthly basis to receive infusions of Immunoglobulin. 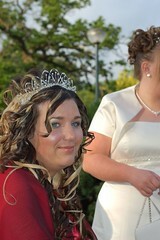 In August 2006, when Emma was 15, she was diagnosed with FALS (Familial Amyotrophic Lateral Sclerosis). ALS is another term for MND (Motor Neuron Disease), ALS is the term more commonly used in the US, MND is more commonly use in the UK. The diagnosis was done by the screening of the SOD1 gene for mutations at Guy’s Hospital in London. Friends of Emma’s have grouped together and done a lot of charity events to raise funds to try and help Emma with anything she might have wanted. A variety of fun nights out were arranged. Using the funds that were raised and some kind donations from friends of the family we were able to go as a family for a fortnights holiday to Disney Florida in the first two weeks of December, 2006. In April 2007 the Make A Wish Foundation arranged for Emma and us to have a shopping trip to London. Emma has had quite a few visit to Rachel House for respite stays. She tends to take her friends with her but in a few weeks time we are all going as a family for the first time.